First, one issue I have with Mr. Ramsay is that if you look up his videos, you'll see he doesn't always do it the same way. For example, the written recipe linked above calls for cooking the mushrooms with some olive oil; but then in the video, he doesn't do that. But overall, I was able to follow his lead and it worked pretty well. Since I was having four seminarians over for dinner, I decided I needed to make at least two of the Beef Wellingtons, and to be sure there was enough for seconds, I made a third. On Monday I got everything I needed at the store. 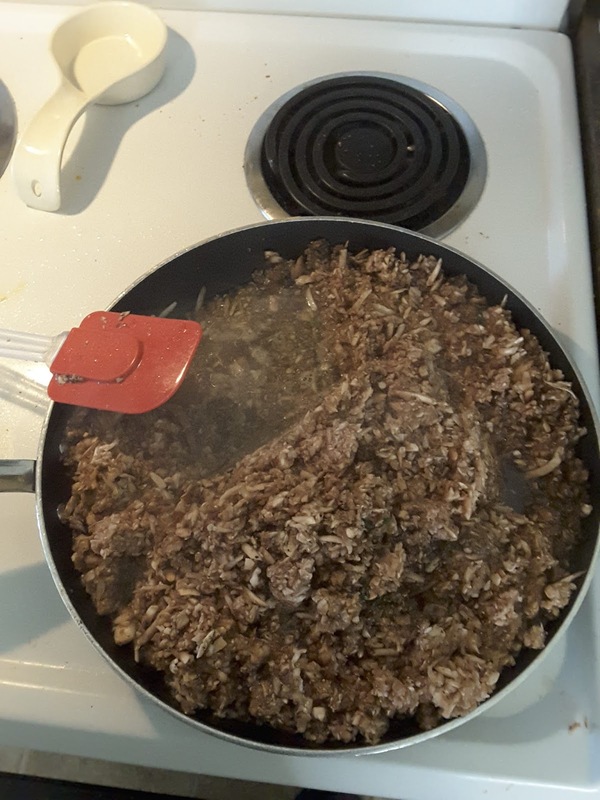 Beginning yesterday, I wrapped the meat into little packets. Ramsay suggested doing it overnight; I was planning to, but forgot; so I ended up chilling them for several hours yesterday. Honestly, I'm a little unclear about what this accomplishes. Ramsay says it gives them "shape," but as far as I can tell, the shape was unchanged from how they came from the store. Next I prepared the mushrooms. I used the food processor as Ramsay suggested -- with trepidation. I've not had success with it; but I'm sure that's because of my lack of skill. One of the seminarians had a helpful suggestion, and it worked! So the mushrooms were nicely chopped down, but not completely turned to mush as I feared. Ramsay emphasizes really getting out the moisture, and I kept cooking and cooking. I was a little nervous about burning things, so I probably could have done it at a higher temperature; and based on how things ended up, I probably could have cooked them a little longer than I did. 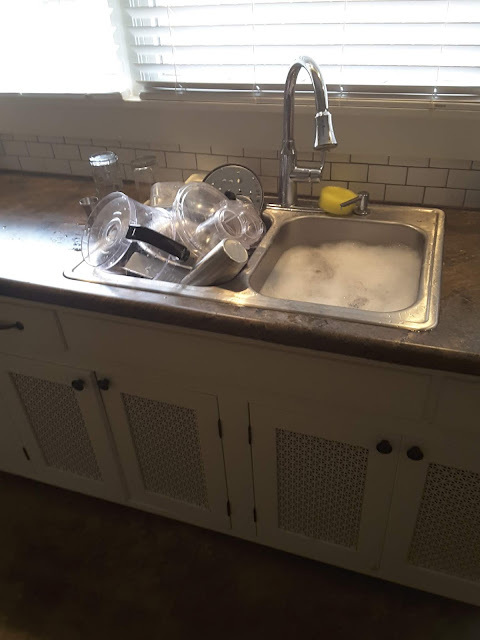 I try to clean as I go. The pile on the left also includes some breakfast dishes, but it's mostly this project. It's still early! The menu included mashed potatoes and grilled asparagus. Since we were planning dinner to follow the 5:30 PM Vigil Mass, I had to get as much ready beforehand as I could. So I decided to wash, peel and cut up the potatoes beforehand. 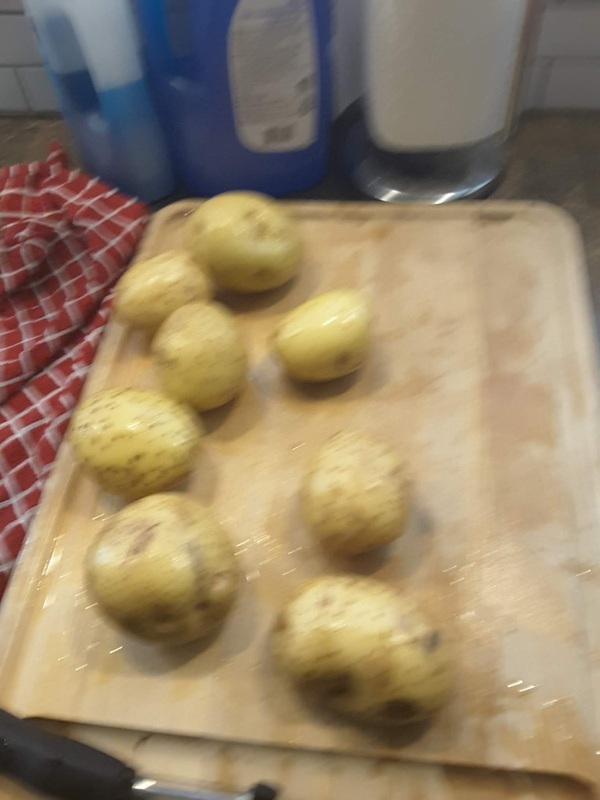 At Ramsay's suggestion, I cut up the potatoes into roughly even pieces; I hadn't thought of that before. Here are the mushrooms cooked down. After they sat on the counter for a bit, I noticed yet more water, which I soaked up with a paper towel. Several times. Only later did I realize I could have simply returned them to the pan. 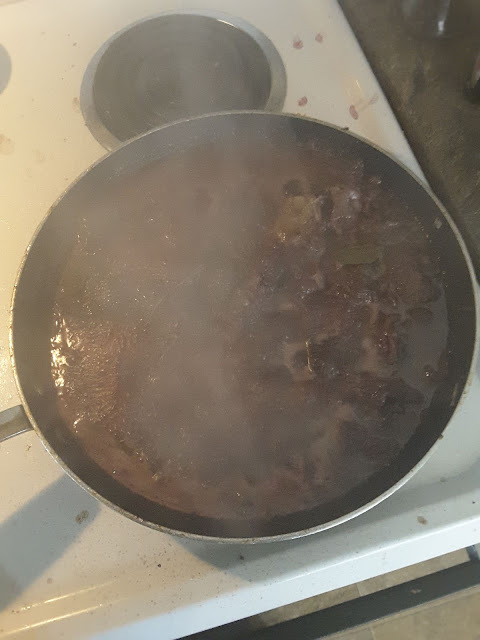 Next I made the red wine sauce. 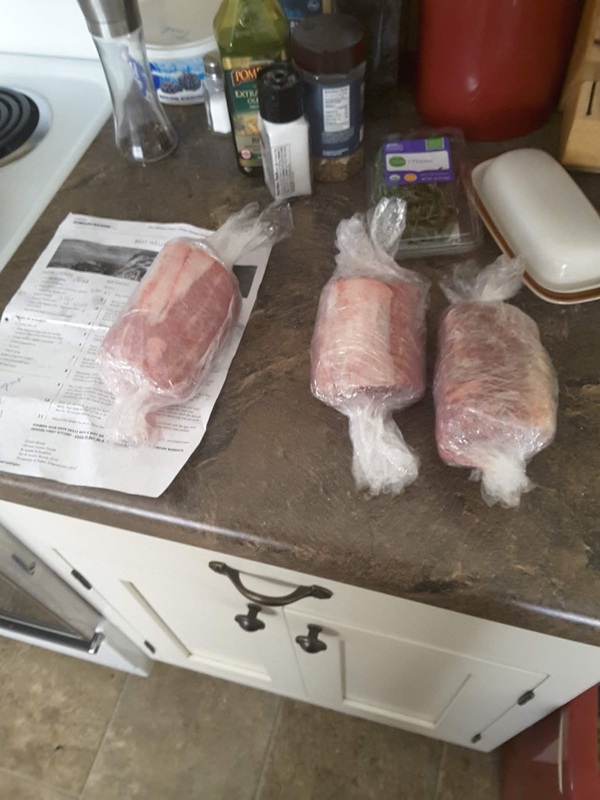 The Kroger butcher didn't have any "trimmings" left from the fillets, so he offered me some pieces of chuck roast. I cut them up further and used them for the sauce. I decided not to triple the amount of sauce I made, and I'm glad I didn't; we didn't use up what we had. In case you are wondering, yes, the mushrooms and this both smelled wonderful. And, again, I was being cautious with this, so it likely took me longer. Ramsay suggested straining this sauce, when finished, through cloth. I didn't do that; I just used a colander. It ended up looking like not much sauce, so I strained out some of the shallots and added them back into the sauce. In fact, there was more than enough sauce when dinner time came. Still, I liked the look of the sauce with the shallots in it. This was my first deviation from Ramsay's directions. I might explain that there were pauses between all this when I attended to other parish business. But, yes, this project did have me in the kitchen for several hours. Here is the puff pastry, right out of the box. I let it thaw for about 30-40 minutes before I rolled each one out, and then returned them again to the fridge. I ended up needing three of these, so I gave the fourth to one of my staff members, because I had no idea what to do with it. When the time came to assemble everything, I was rushed for time -- Mass time approaching! -- so no pictures. I tried my best to do everything as Ramsay suggested, but I didn't manage exactly. First, the pieces of meat I had were fatter and shorter than what he works with in his videos. As a result, the ham-and-mushroom layer didn't quite encircle two of them. 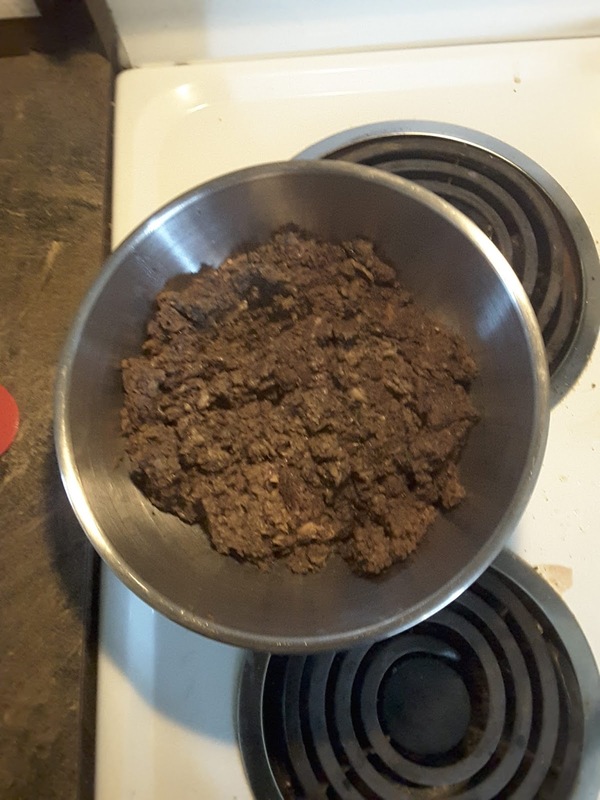 Second, I found the "duxelle" -- i.e., the mushroom paste -- wasn't staying put, and I didn't use it all. (The leftover duxelle I put in the fridge to have with this morning's eggs, and I forgot until just now about that plan.) 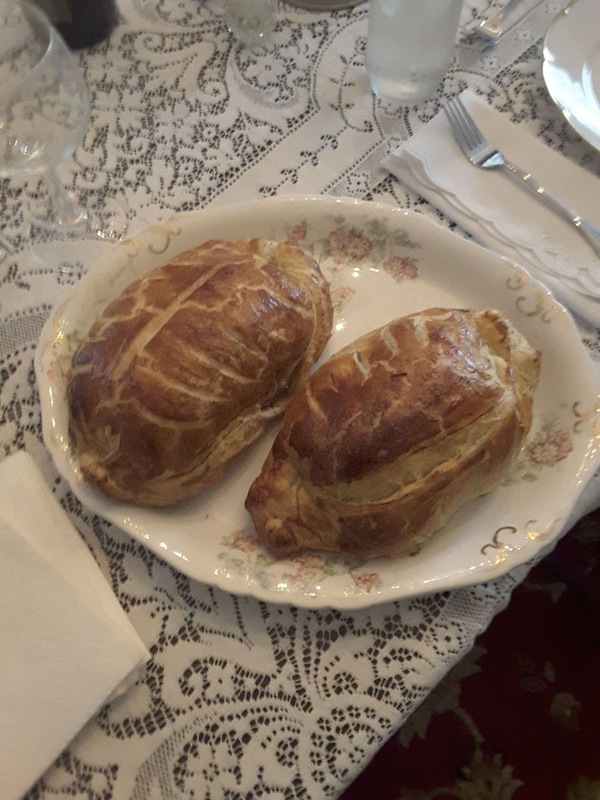 Third, I forgot to put mustard on the meat after searing it -- which I did exactly as GR suggested -- so, I did it after wrapping the meat in the ham, but before wrapping in the pastry. Finally, I did use dijon mustard, because I like it, and that's what I had. Sorry Gordon! As I was rolling the final product together, because of the stoutness of the fillets, I had to do some stretching with the dough; I hadn't rolled them out enough. But I was able to re-roll the second and third sheets, and it worked. 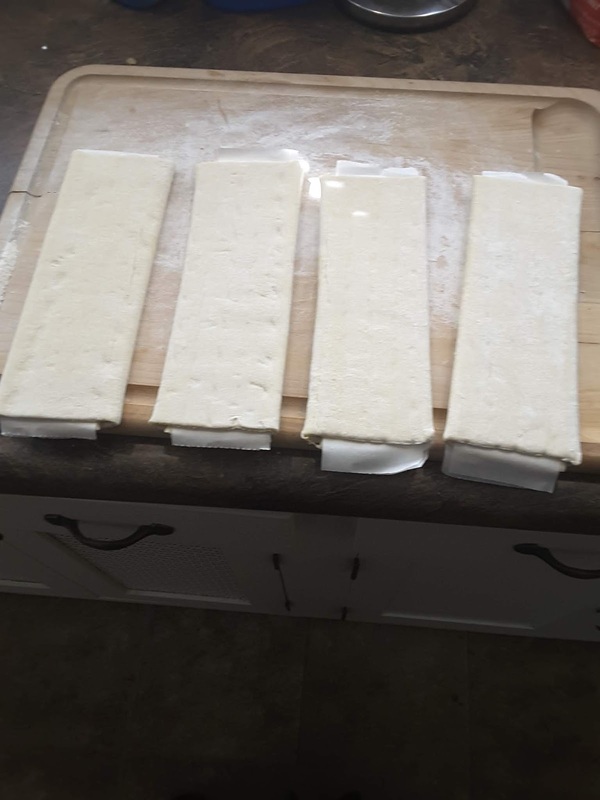 Then I remembered Ramsay saying to "trim" the pastry, but I couldn't remember just how he did it, so I just folded up the ends and hoped for the best. After it came out, I see why he suggested that, and I re-watched the video to see how he did it. So how was it? Overall, very good! The meat was cooked just right. The pastry came out pretty well, but a little soggy. That could have been because I didn't start with the right temperature, or the mushrooms not being dry enough. That also meant the pastry fell apart when I tried to serve it, but it still tasted very good. We ended up eating every bit of these two, saving the third for dinner tonight. Everything else turned out really well and we had a very enjoyable evening. We had red wine with this. For dessert I picked up a "tiramisu" cake from Krogers; it didn't taste that much like tiramisu, but it was pretty tasty. Then digestivos for any who wanted them. Afterwards, we watched a film called "Argo," about the thrilling rescue of six American diplomats from Iran, who got away from the embassy when the Iranian mob stormed it, and were shielded by the Canadian ambassador. After this cooking adventure I bet ‘Argo’ was pretty tame. We need to shoot and cook pigeons soon. Are you ‘game’? That sounds like fun. I am a terrible shot; but I will do my best not to shoot you. Is this something you do at 4 am? Ha! Then planning must start. My paster won’t allow me to shoot the pigeons off our statues so we must find a grain mill around here. Looks great! I may have to try it sometime this fall.